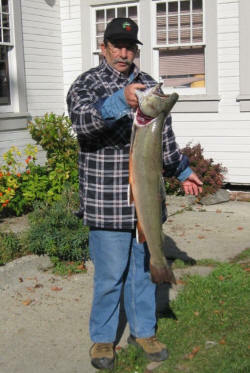 Yours truly, Randy Zelonka, 35 1/2 inches of Gerrard Rainbow Trout, Jan 1st 2011 local derby winner. "They don't let me out much so I have to do it all at once." 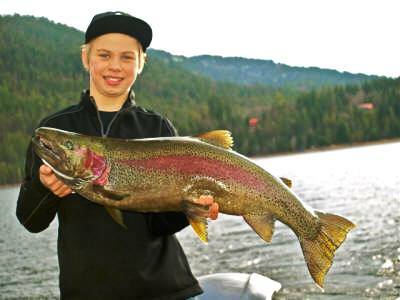 Length was verified while we were still on the water so this fella went back in to fatten up for the next year. Walter '26er' Wishlow... 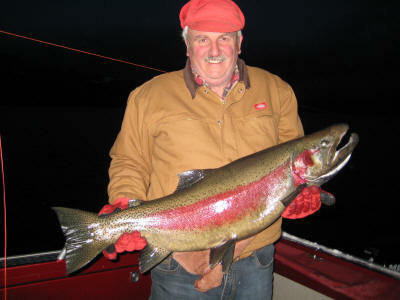 This brute weighed in at a cool 26 pounds and definitely needed buddy Ron Milton to help smile over this one. 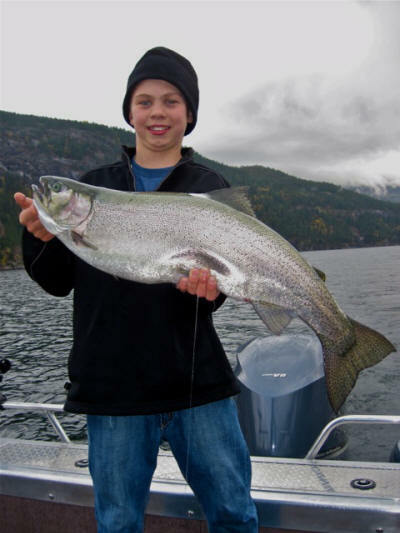 A great day of fishing for the boys from Passmore with Capt. Split Shot Mike. Feb 11 2011 Local Rick Boyce presented this when Randy told him he needed a newer picture of him for the door. Good Eating Rick! IF he didn't before he believes you're a man of your word now. 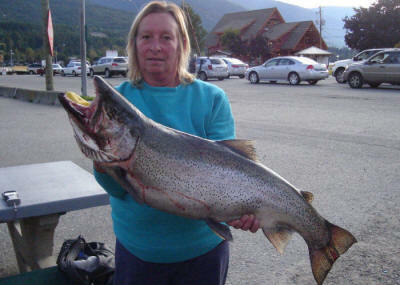 Darlene Anderson with her 20 plus prize from 150 feet down.. Darlene was out with Capt Randy Ingham on Sept 2011 Dalas Barraclough and her Oct 7 , 16 lb 7 oz Gerrard Rainbow Trout... It was the catch of the day in the Capt K boat. Dalas is nine. Russ Sprogis Demonstates the "Fish Kiss" the proper way it should be done.... 18 lb and 6 Oz of fighting Gerrard and guess who won? 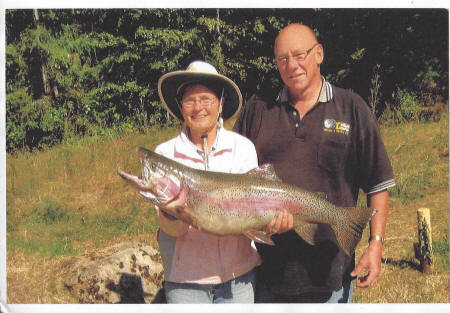 Ron and Friend sport their catch of the day ... a 21.5 lb Gerrard Bow fought in on Oct 16 2011. 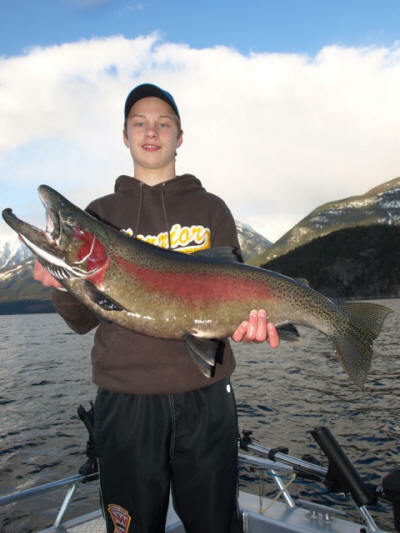 These boys had a wonderful trip with Capt Mike of Split Shot Charters who submitted the picture . Nelson City Police Derby 1St place Dolly. 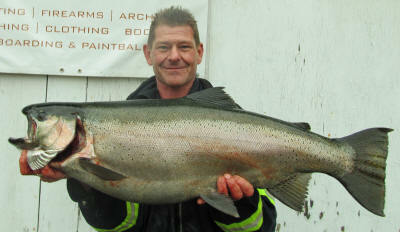 Way to go Rick .... 21 lb Gerrard Rainbow Trout Dec 2011 The Cleary family sports their big bow. 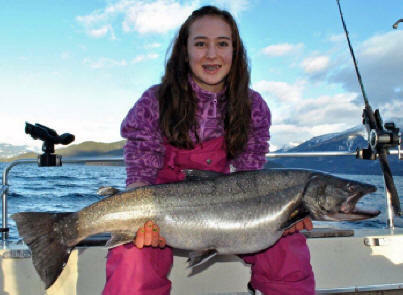 A happy day for fishing Dec21 2011(just under15lbs on the Gill and Gift scale) Karlee Hall of Jaffray B.C. 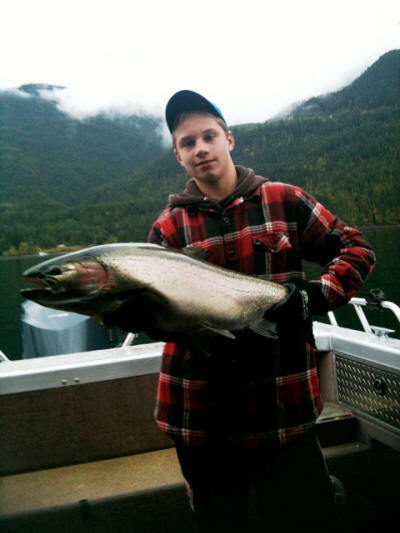 landed this prize catch on Dec 29. 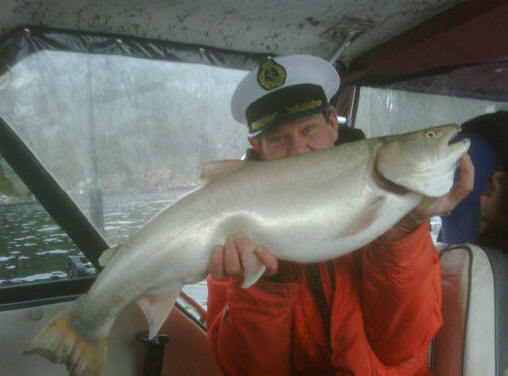 The 17# Bull Trout was caught on the Shadow Mountain Charter boat. Way to go Karlee.